With Marrakesh such a hot destination – and so much more accessible now that it’s firmly on the low-cost airline map – entrepreneurs are opening up some great boltholes in the Atlas and Sahara to entice those keen to see what lies beyond the souks and palaces of the sophisticated urban gateway to Morocco’s south. They won’t be disappointed; a handful of rarefied mountain resorts offer the opportunity for serious trekking and a serene retreat from the fleshpots of Marrakesh, yet are close enough to be combined with a couple of buzzy days in the city. 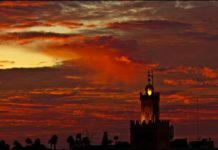 And beyond, for the real adventurers, lies the desert, with its Kasbah trails, date oases and a host of opportunities for adventure holidays, including, perhaps, a night or two under the stars. Although it’s easy to reach the Sahara in less than a day’s drive from Marrakesh, there’s much to be said for lingering awhile amidst the Atlas peaks. Fashionistas are making it difficult to get into Richard Branson’s place, Kasbah Tamadot, but some purists prefer the simpler, Berber-run Kasbah du Toubkal, with its stunning views – so vertiginous, the journey to its doors must be completed on the back of a donkey. 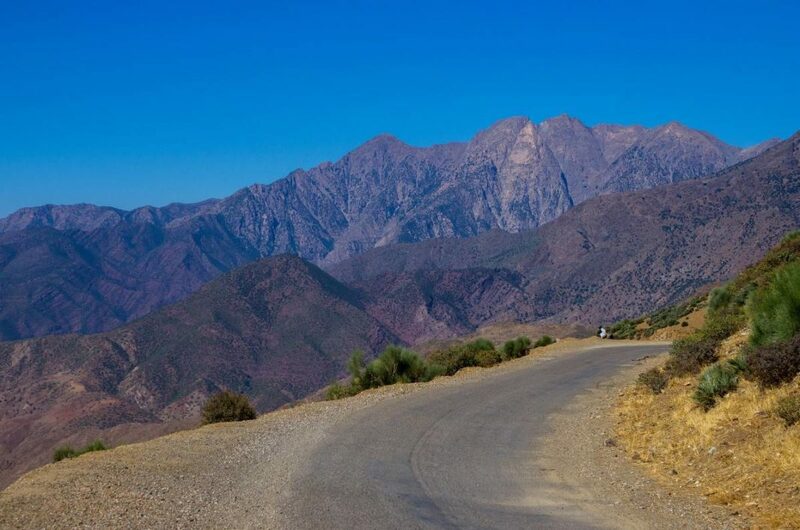 Those who decide to skip a mountain stay and head straight for the desert will in any case get a taste of the Atlas on the wonderful Tizi-n-Tichka pass linking Marrakesh with Ouazarzate in less than four hours. There are a couple of unmissable stops, notably Telouet, a spectacular ruined Kasbah once owned by actor Edward G. Robinson’s brother-in-law, a member of the Glaoui tribe, staunch allies of Morocco’s French colonial rulers. Disgraced as traitors with the advent of independence, their palaces were left to rot, but the magnificent interiors of this Kasbah, at least, remain highly atmospheric in their decay, and a visit is unforgettable, especially if followed by a simple lunch in the Berber tent more or less opposite the kasbah. From here it’s a short drive to Ait-Benhaddou, an entire village of picturesque kasbahs and backdrop to many a biblical movie; it’s set up for overnight visitors as well as day-trippers. Despite its own impressive Kasbah, Ouarzazate is more a base for desert adventures than destination per se. A dull strip of a town, it has acquired a few reasonable hotels since becoming a Mecca of film production. Of the two studios, Atlas is set up for visits, though the on-site Oscars Hotel is not up to scratch. Great dining is to be had at Chez Dimitri, a former Foreign Legion hangout which offers a buzzy, cosmopolitan dining experience. Ouazarzate offers many choices for adventure-seekers wanting to trek, bike, undertake camel rides, 4×4 safaris or overnight bivouacs under canvas, but little in the way of shopping or nightlife. Zagora, which lies a further 90 minutes south in the magical Draa Valley, a route of date plantations and Kasbahs, is a much more attractive and central Sahara base. Many of the best hotels seem to have been bagged by Italian tour operators who got there before the Brits, but you can still dine romantically in a Berber tent in the charming garden of the Ksar Amaa hotel. South of Zagora are some of the most exotic desert attractions Morocco has to offer, including Tinfou, with its spectacular dunes and camels for hire, and Tamegroute, a traditional village famous for its 1000-year-old Koranic library, whose residential section you can explore with guides. Returning to town, check out the silversmith in the old Jewish quarter just to the south; he has fabulous doors, mirrors and other artefacts salvaged from abandoned houses. A far more rewarding route than retracing one’s steps is to make a triangle, heading from Agdz at the top of the Draa Valley via a new road across a cobalt mine into the Souss country of the Berber farmers, and thence to Taroudannt. This is something of a last-chance opportunity, given the speed at which farmers of all creeds are deserting the tough farming life in search of softer options in the tourist industry. What remains of rural sights in this geographically isolated area – traditional adobe houses decorated like cakes, shepherds coaxing goats out of trees and women in beaded habits carrying cattle fodder for miles on their heads – can be seen on a beautiful route which takes in the saffron-growing area of Tallouine and the red-earthed foothills of the Anti Atlas. 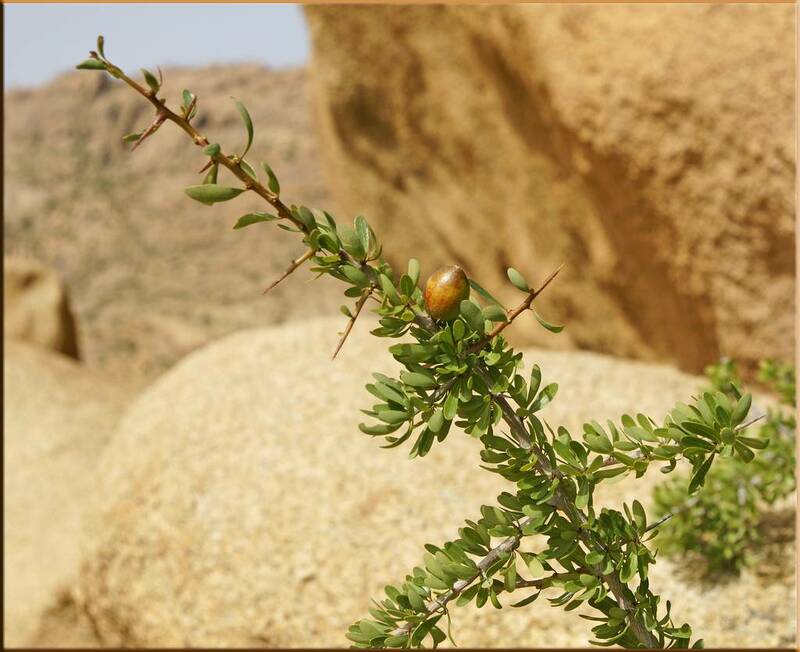 This is the place to buy argan oil, prized for its nutty flavour; you won’t see the distinctive trees which produce it anywhere else in the world, and may well catch the startling sight of greedy goats leaping into their branches. The heritage trail ends in Taroudannt, once a centre of silver-smithing but now distinguished mainly by its beautiful mediaeval ramparts, and a peaceful Jewish cemetery hidden behind the souks whose caretaker will point out the exalted graves of the rabbis. Outside Taroudannt lies one of Morocco’s smartest hotels, the pricey Gazelle d’Or. But you won’t be disappointed with the Palais Salaam, built into the city’s magnificent ramparts; its loft-like duplex rooms could have better lighting, but the hotel, a former 19th century palace, does have a lovely pool and gardens, and a not-half-bad dinner buffet whose international offerings make a welcome change from the sometimes samey Moroccan fare. 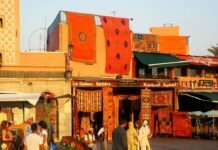 From Taroudannt there’s a choice of return journeys – back to Marrakesh across the spectacular Tizi-n-Test pass, or to Agadir, a major coastal resort with its own international airport.